When I’m at work, I fix or flag non-standard or questionable usages. When I’m not, I don’t, unless I’m asked. If people are communicating in their natural vernacular, I wouldn’t dream of ‘correcting’ them. It would be misguided and rude. Besides, informal usage is often more colourful (because more varied and less constrained) than standard English. Non-standard usages don’t bother me. At all. Why would they? I’m a scientist and language lover (and Hiberno-English speaker), not a zealous conformist harbouring fantasies of omnipotence. Typos don’t upset me either – even trivial mistakes can be linguistically interesting. Sadly there is a false and widespread belief that enthusiasm for grammar means fixation on correctness. This is why some people worry about errors when talking with editors. Granted, some editors are sticklers 24/7, and the fact that ‘grammar’ is commonly thought to include spelling, style and so on compounds the problem. Prescriptivism is inherently conservative. It errs on the side of caution, saying: That word you’re unsure about? Use it this way – the right way. Whereas descriptivism might say: Here is the evidence. These are the ways the word is used, how that has changed through history, and what different commentators say about it. The rest is up to you. Sometimes writers want prescriptive input: a simple answer (even if misleading), not a complex account of variability. But without context this approach fosters fallacies and dogmas. Usages don’t go from being incorrect to correct or non-standard to standard overnight. They go through (and sometimes remain in) phases of contention, where they may be considered standard by some authorities or in some populations and not others. When I write about disputed cases on this blog, I point out such discrepancies where they exist; a recent example is like as a conjunction. In editing, as in usage, grey areas of legitimacy and appropriateness arise routinely. For instance, the author of a book I copy-edited used the word combo in a factual discussion. Based on the text’s type, genre, and voice, among other considerations, I flagged the word for review. I noted that it would give the text a casual, breezy tone, and if this was desired, that was fine, but that combination was available as a more formal – and unimpeachable – alternative. Regular readers of this blog will know that my linguistic interests include slang, neologisms, and other creative avenues of language use far removed from the vaunted halls of standard usage. From a solely practical point of view I find it helps, when editing fiction especially, to be aware of these trends, even if such words and innovations crop up only seldom, if at all, in the texts I work on. Because the acceptability of a usage can change over time, editors have a responsibility to stay informed about these shifts. It’s not good enough to reject a usage based on advice from a century-old text like Fowler, astute and witty as it often is, or even from a modern reference if it springs from feeling and not fact. Usage lore is full of dinosaurs like hopefully and over/more than which became standard long before the AP Stylebook saw fit to permit them, which delay served only to confuse people about their true status. Before the AP Stylebook updated these entries, writers and editors using AP style would have had to reject what were otherwise legitimate items. In general usage and under certain other house styles, sentence-adverbial hopefully and over = more than may be allowed without a second thought. So for editors it’s a question of flexibility, of adapting to local conditions. @BCDreyer All good points but not incompatible w/descriptivism. We can enforce local traffic laws without despising left-side drivers. @Jan__Freeman I make haste slowly. A good copy editor, I'd say, is 5 to 50 years behind the alleged times, languagewise. 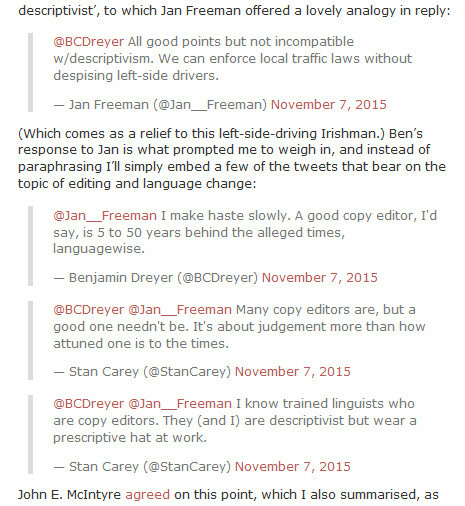 @BCDreyer @Jan__Freeman Many copy editors are, but a good one needn't be. It's about judgement more than how attuned one is to the times. @BCDreyer @Jan__Freeman I know trained linguists who are copy editors. They (and I) are descriptivist but wear a prescriptive hat at work. 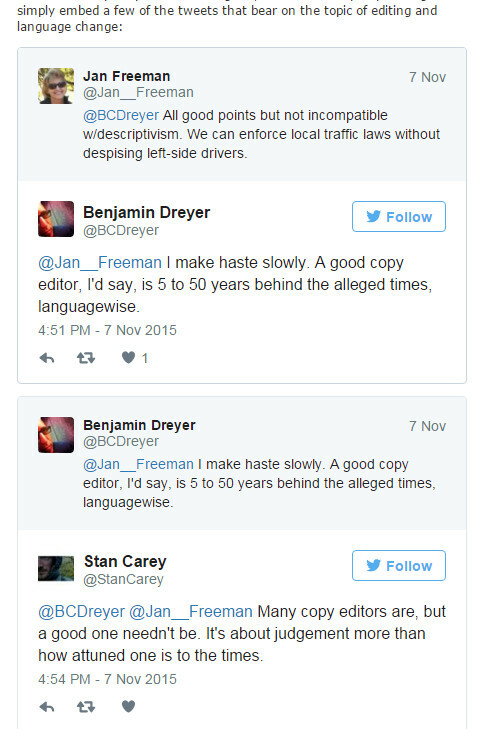 @BCDreyer @Jan__Freeman I'm just disputing the assertion that a good copy editor is necessarily behind the times, language-wise: not so. We’re a broad and eclectic tribe, capable of adjusting to conditions and (hopefully) of overriding our preferences in the interests of the text at hand and the readers for whom it’s destined. Behind the specific skills we share lie a wealth of personality types, tastes, and attitudes to language variation and change. There’s room for us all. This entry was posted on Tuesday, November 10th, 2015 at 4:34 pm and is filed under editing, grammar, language, usage, words. You can follow any responses to this entry through the RSS 2.0 feed. You can leave a response, or trackback from your own site. Hi Vinetta. I’m lucky to enjoy the privileges I do, including the sociolinguistic one of being a native-English speaker blessed with a decent education. Schooling necessarily instructs children in standard English, and I think there has been a general trend away from deploring non-standard dialects and towards acknowledging their appropriateness in non-formal (i.e., most) contexts. Children learn to code-switch and often grow up bidialectal, ideally with no hang-ups about their native speech. But I’m reminded of the unedifying Ebonics controversy in California which led to a reasonable pedagogical proposal rooted in students’ use of AAVE being abandoned because of fundamental misunderstanding of dialect and the politics that lie behind it. This is all a bit off-topic, though, so I’ll stop there. Thanks for your response, Stan. I diverged as well. Sometimes, I’m prone to reflect beyond the topic and point being made. Yes! well said! when proofreading or editing we leave our personal preferences aside and do the job. you can be a descriptivist at heart but still know how to make the text conform to the conventions of standard English. Thanks, Meirav. One of the more beguiling aspects of linguistic mistakes is how they can end up being ‘correct’, either fully standard, like the word umpire, or locally appropriate like teh in lolspeak. So I prefer to reserve judgement! Edited prose from reputable institutions should ideally be free of error, it’s true, but given the pace and pressures of modern publishing it’s understandable that typos creep in. I read an article in the Guardian last week with half a dozen basic errors, but it’s not worth the damage to my blood pressure to get too angry about this: I just alerted them on Twitter and a sub-editor fixed the mistakes. Good to hear that tweets can work well for this sort of thing. Maybe I should try that next time. Can prescriptivist apply only to standard English, and primarily to written standard English? Would you, for example, offer prescriptions (or proscriptions) concerning another Hibernian’s use of Hiberno-English? If not, prescriptivism has a much narrower range than descriptivism. I would say it can apply to any variety of English. Most of the time prescriptivism is geared towards standard usage, but other local norms sometimes need to be enforced too. For example, I’ve proofread novels in Hiberno-English that required some fixes to usages characteristic of that dialect. Nor need it be solely a matter for writing: anyone who speaks on radio or TV invites criticism from the public about their use of language. I think there’s something in Ben’s point about copyeditors keeping a few years behind the times. Most of the organisations that use copyeditors are likely to want a style that isn’t right at the edge of language change. So in practice, most copyeditors would be right to aim for s style that’s a bit behind the times. Obviously there are exceptions, such as for marketing or advertising (depending on the campaign) and for newer publishers that want to be up-to-the-minute (Buzzfeed springs to mind). I can see what you and Ben are getting at, I think, but my point is that it’s not necessary to be behind the times. Would you be a better copy-editor if you were less aware of current slang and emerging grammatical change? I don’t think such knowledge impinges on a good editor’s ability to recognise what is and isn’t appropriate in a given context. They can savour (and even use) the latest linguistic fads and still, when editing, apply a more traditional style without difficulty. And, as you suggest, it’s a positive advantage to be familiar with current trends in usage if one is editing for fashionable new publishers. I totally agree: I definitely want to know about current trends (just as I want to know about obscure usage superstitions). By ‘behind the times’ I mean how you act, not what you know. Right: we’re agreed then! I don’t think Ben was referring to how you act (i.e., while editing), but it’s possible I misinterpreted. In more words: As much as I sometimes pose and posture as hidebound, in real life I’ve always got my eye on new ways of doing and saying things, with an eye toward helping them along and endorsing them. That said: If I could say it in Greek or Latin, I would, but I like to make haste slowly. Ben: Not just your eye but your fingers, I’ve noticed, in tweets that adopt or play with novel usages. The combination of modish formulae and forbearing attitude, the one tugging loose but restrained by care for propriety and absolute attention to detail, can be a joy to behold. Excellent post, Stan. I’d actually argue that all people are naturally both prescriptivist and descriptivist. We identify norms (whether consciously or unconsciously) and then adhere to them. Even people like Mr. Dreyer who insist that they’re not descriptivists are probably pretty good at identifying language norms and then deciding whether or not to adhere to them. That’s a good point, Jonathon, and further confirmation of the degree to which the two states overlap. Despite my accounts of how I have a foot in both camps (or at last a couple of toes on the prescriptive side), I’m probably guilty of oversimplifying things by using the dichotomy as a shorthand or starting point. I think it’s just really hard to fully disentangle the two, especially when it comes to actual practice. In theory, sure, you can talk about one without the other, but it all becomes messy when you start talking about how people behave. Prescriptivism is pretty appealling to people at a certain level of linguistic development. You need to know the rules before you can break them, and at the point you’re learning them, seeing them broken can cause an exciting “gotcha” feeling and a desire to show off one’s knowledge/reinforce one’s power etc. Some people never grow into this phase, (including most likely a lot of people who have low linguistic skills, and also linguistically capable people with low need to show off, (many of whom are probably women)). Some never grow out of it. Some are jovial and benevolent descriptivists right up until we’re interacting with someone we don’t like. Then we can get a bit hissy. It’s true, language use is often a scapegoat for more personal judgements. I think it’s common for people to complain about this or that usage as a way to complain about the people with whom they associate it. The solution is to stop judging language or people. Descriptivist… Prescriptivist…? Jings, I had no idea that I could be either. I just write to try to communicate, and read to try to understand. I earn much of my living by writing but all this stuff baffles me (or bafflificates or bafflifies me)… Interesting though, in a navel-gazing kind of a way, I suppose. Navel-gazing? Hardly. For analogy: I grew up beside a wood on the shores of a lake, so I was a nature-lover from childhood. But studying biology, far from interfering with that, enhanced my wonder at (and interest in) the natural world. It’s the same with language: a little systematic attention goes a long way. James Salant makes what I think is a good distinction between prescription and prescriptivism. When we prescribe, we say “This text needs to follow this standard”, and if we are editors, we make it do so. Prescriptivism is an ideology that says that if you don’t follow the prescription, whatever it is, you are not a morally worthy person. The former is harmless, if it’s not serving as a gatekeeper to keep people out. The latter is poison. That’s a useful way of looking at it, John. I would adjust it to say ‘a less morally worthy person’, even if some prescriptivists would identify with the more extreme and unforgiving form. I’m entirely there: editor by trade, linguist by inclination and incomplete doctorate. But I agree they are not necessarily mutually incompatible. In particular, I work with translated and annotated texts, where I attempt to encourage “scholarly” language in the annotations, while allowing a much freer hand in the translation itself. This exemplifies that, even to the editor, there is no one standard form. There are innumerable registers, and the editor’s job (as far as I am concerned) is to ensure that the appropriate register is selected for the content, and that it is then consistently applied. In one text I worked on, a Flann O’Brienesque novel, a previous copy-editor had flagged many words in the translation as “not real words,” without realizing that the whole point of the original Arabic was its glorious and silly neologising. I disagree, though, with another commenter’s claim that—even in the most formal of contexts—an editor should be behind the times in language use. The readership are not (except in the possible case of the Daily Telegraph), and the job of the editor is to make the text as pellucid (thanks, Robert Jay) as possible for that readership. As such, I don’t even have a problem with editors as trailblazers, attempting to strip language of some of its fossils: I’ve argued here that, even in scholarly texts, the use of many Latin expressions is simply obscurantist and should be done away with (I have varying success in persuading my authors of this, it’s true). I tolerate “cf.” in footnotes minimally, for concision of space. In endnotes I try my hardest to encourage authors to use “compare,” but I have to accept that the style guide for my project (CMS) allows for “cf.” so I can’t actually strike it out. The great offenders, in my book, are supra and infra which cannot even claim to brevity. But “cf.” does rankle with me too. As I say in that (apparently previously-linked to) rant: if the expansion of an abbreviation in the abbreviations list then itself requires a gloss, there seems to be something falling short here in terms of clarity. 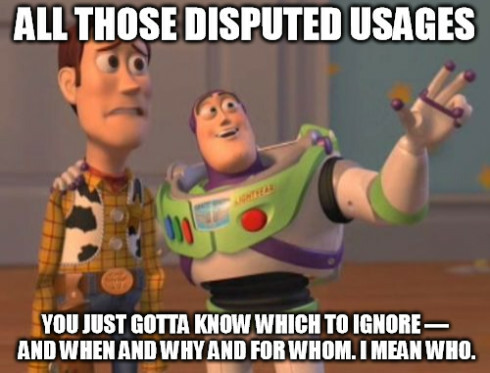 Of course, all of this means that I should oppose “i.e.” and “e.g.” And, actually, I do try to get “that is” in place of “i.e.” (especially where a note starts with it; “I.e.” is just horrible) and “for instance” in place of “e.g.”, but again where concision really is a requirement I tolerate them. As a general rule, in formal and semi-formal texts I restrict e.g. and i.e. to lowercase and parenthetical use. But I don’t oppose them just because they’re Latin. Some people might mix them up, and many might be unaware of what they stand for, but their brevity is convenient and their use at all levels of English is well established. For many people, including busy editors, nuances and judgements are not the first priority. I’m looking forward to Ostler’s book. That sequence of events is how we ended up with some of our best-known grammatical and stylistic superstitions. Nuances and judgements must sometimes be sidelined, but the trouble is when this gets calcified into holy writ. A vicious circle can arise whereby style guides proscribe a usage because they think it’s substandard, editors remove it because it’s proscribed in the style guide, dictionaries flag it as informal or disputed because it’s excluded from edited writing, and the pointless cycle renews itself. I followed a link to your Macmillan post ‘Grammar at cross-purposes, and noticed that you talk about ‘natural diversity and nuances’, which is very close to John’s ‘nuance and flexibility’. A good post and with worthwhile comments too. I’m also an editor and I agree with the need to edit for different registers and styles. The ‘pace and pressures of modern publishing’ you mention in a comment are, as I’m sure you’ll agree, responsible for more than just typos. I’ve edited a number of documents where there was no time to do proper structural editing; a quick copyedit was all that could be done in the time left and some structural flaws just had to stay. I’m more inclined to correct other people, usually family members, but I also expect them to point out my errors too. Is there a way of simplifying the reporting of Twitter exchanges? Simply embedding them looks cumbersome to me, but perhaps I’m not used to reading them. Yes, very much so. The article I mentioned (with ‘half a dozen basic errors’) included some factual howlers as well as just typographical ones. In my editing and proofreading work I’ve experienced similar scenarios to the one you describe, where deadlines are looming and the writer – whether aware or not of the text’s structural shortcomings – wants to at least have it presented well. How tweets appear on this blog depends on the device and browser used. It may look like this or like this, for example. The former, which I see on Firefox on my desktop, is plain and minimalist. The latter, which I see on Chrome and is similar to how it appears on my phone, is heavily redundant, since each tweet that’s a reply includes the tweet being replied to. It’s cumbersome, as you say. I could use screengrab images, but that’s finicky in other ways and I would still want to link to the original tweets. So I just embed the tweet URLs and trust WordPress to present them legibly. Somewhere I picked up the understanding that you are a bi-dialectal copy editor: that you can edit to AmE as well as to BrE and related varieties. I always thought this was awesome, since I (and His Hatness and other copy editors I know) depend fundamentally on intuition to spot errors, though correcting them sometimes involves research. I could readily translate BrE to AmE, but the other way around would be far too subtle for me, as would editing badly written BrE. I could just do it maybe with spelling checker, grammar book, etc., but I’m sure I’d miss a thousand errors, as well as wasting time over things that aren’t errors at all. But looking at your professional blog, I see no testimonials from Americans. Am I just wrong about what you can do? And if I’m right, how the devil do you do it? And what about non-native speakers who need their texts to be idiomatic and transparent AmE? That would be even harder, I think, than correcting native AmE, where most of the AmE flavor would already be present. I can and do edit AmE text, but the vast majority of my editing and proofreading work is in BrE or Irish English, hence the predominance of UK and Irish testimonials on my website. I don’t think I’ve asked any Americans for one, now that you mention it. When I edit in AmE, the text is generally already in AmE, so it’s not a matter of converting the dialect, more of ensuring that the style is consistent. If a client is a non-native-English speaker who wants their text in AmE, I pay special attention to spelling and idiom in this regard. And if a text requires greater familiarity with the nuances of AmE than I feel I can offer, I say so. I agree with essentially all of this fine blog post. Your viewpoint on language and editing seems commendably sane. I’m going to print this blog post and put it in my folder of wise thoughts and advice on the English language. Thank you. Thank you, Vivian. That’s a lovely thing to hear. Sanity is often lacking in discussions about usage, so I hope to help counter that in a small way.